The Mk.I-B is my favorite non-Atomic bead, I dig that tapered/radiused Blunderbuss-style muzzle. Because they know lots of you missed out on the last drop, The Boys in the Back Room the Department of Secret Projects cooked up another small drop of Mk.I-B’s in that crazy Gamma Decay finish on Ti. These have lots of purple, great coloration on this batch. These are titanium beads with a mottled and uneven finish. There are colors ranging from silver to gold to blue to purple and that coloration is truly random. Some have more of a gold coloration, others are more on the blue/purple side of things. Most have color swirling more on one side than the other, but all have the same type of look. No two beads are the same, these are all unique. The bead you receive will be randomly selected as I don’t have the ability to efficiently list them one at a time. 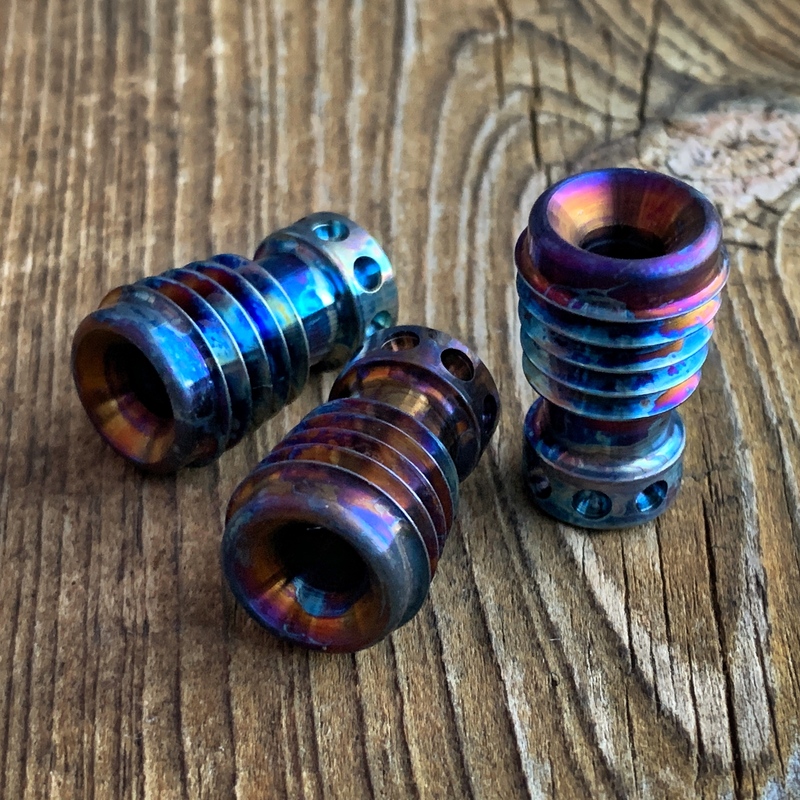 The colors here will make a really nice partner with any of your MokuTi or Timascus gear. Without question, my new favorite finish, in spite of the challenges to reproduce it. Mk.I-B Ray Guns in Gamma Decay Titanium are $95 each, shipped to US addresses. US buyers can purchase using the PayPal “Buy Now” button below. Buyers outside the US can hit the PayPal button to purchase and then contact me for a USPS Priority shipping quote at mark@raygundivision.com – Typically this ends up being an additional $15-30 due to Priority International cost, depending on location. Please Note: Shipment outside the US via any method other than tracked Priority or Express is at the buyer’s risk.